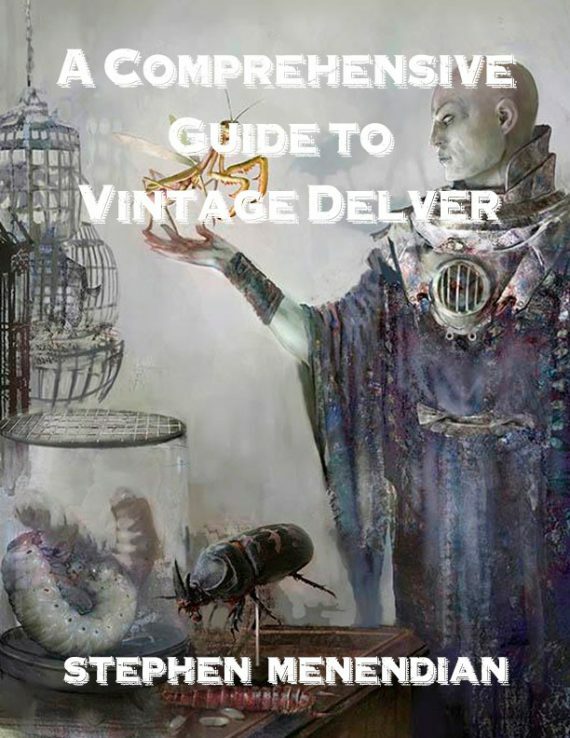 In his first major deck primer in over a year, and fresh off his win of Season 1 of the Vintage Super League, Stephen Menendian delves into the depths of Vintage Delver, with over 50 pages of in-depth content. With a comprehensive look at building the deck piece by piece, executing the game plan, sideboarding strategy, and in-game tactics, this is something no serious Vintage fan should miss. The archetype generally known as “Delver” is not only the most successful tournament performing Gush deck in contemporary Vintage, it is likely to remain there, regardless of changes to the Vintage card pool, for the foreseeable future. Delver’s strong position in the Vintage metagame is structural, and even restrictions to cards like Treasure Cruise would be unlikely to dislodge it from its lofty perch. In the hands of a relatively new Vintage player, Delver can be a deadly weapon and an instantly competitive deck choice. In the hands of a seasoned and practiced Vintage player, especially a Gush expert, Delver is a threat to win any tournament. The Delver archetype broadly refers to any blue-based tempo strategy that runs between 8-13 creatures from a short list, including Delver of Secrets, Young Pyromancer, Tarmogoyf, Snapcaster Mage, Trygon Predator, and Vendilion Clique. Sometimes fringe creatures such as Deathrite Shaman appear in the archetype, but it can be instantly identified by the presence of Delver and Young Pyromancer, surrounded by a dense suite of efficient countermagic, cantrips, and blue card drawing spells, most prominently Gush, Treasure Cruise, and Dig Through Time. Although Delver of Secrets gets top billing as the deck’s namesake, it is sometimes played in fewer than maximum quantities because Delver is not the actual star of the show. While Delver facilitates quick tempo wins, it mainly fulfills a functional role in this archetype, permitting the pilot to reliably shift into a tempo role or race aggro-based strategies like Merfolk. Similar decks over a decade ago that relied on growing creatures (such as Quirion Dryad) were known as “Grow” in both Extended and Vintage. Later, in Legacy this archetype came to be known as Threshold, even though the threshold-based creatures were gradually replaced as more efficient threats were printed. Delver decks share basic characteristics and similar features with these progenitors, namely being UGx, using the most efficient threats, countermagic, and removal. Although these decks typically used a mixture of creature threats, Grow decks in Vintage eventually weaned down to just Quirion Dryads (after cutting Ophidian and later Psychatog). Delver is merely the latest evolution of this Grow archetype, and its lineage can be traced directly back to the deck that won the 2002 Type I Championship (as told in Schools of Magic: History of Vintage – 2002). Disguised as a Legacy archetype, Vintage Delver is deceptively powerful and distinctively different in both operations and strategy. The Vintage version is capable of unique lines of play, flexible role assignment, and more varied strategic options. Although Treasure Cruise and Dig Through Time are this archetype’s newest toys, this deck is also anchored by long time Vintage staple Gush, a card that is prohibited in Legacy. Before the printing of Khans of Tarkir, the differences between the Vintage and Legacy versions of the archetype were more evident. Gush gave the Vintage version of this archetype a reliable source of real card advantage, something the Legacy version lacked (the virtual card advantage provided by unrestricted Brainstorm is not the same thing). Moreover, most blue Legacy decks had similar mana bases to the Legacy Delver deck, whereas most Vintage decks were constructed on much larger and more expansive mana bases. Both of these facts meant that, prior to Khans of Tarkir, Vintage Delver was far more capable of playing a stronger control role in Vintage than Legacy Delver was in Legacy. Although less evident since the printing of Treasure Cruise, despite the superficial similarities, Vintage Delver should not be mistaken for its Legacy cousin. Vintage Delver is a very different animal. This article is your comprehensive guide to Delver in Vintage. First, we’ll look at the complete history of this archetype in Vintage, tracing its evolution through new printings, innovations, and metagame shifts to provide a broader sense of the scope for this deck’s current configurations, and an appreciation for its evolutionary trajectory. This trajectory provides a useful context for considering the potential direction of the archetype into the future. In section II I will provide a general overview of how to play this deck. I will break down this deck’s game plan into its various stages, and explain the areas of emphasis and basic operations within each stage of the game. I will describe how, when, and why to switch roles, describe the deck’s key functions, and how to operate the deck in general terms. Using illustrative examples, I will provide guidelines for mulliganing and discarding decisions. In section III we will canvas card choices for Vintage Delver, and explore the basic tactics available to the Delver player. I will offer my views of the strengths and weaknesses as well as the key function of each tactic in various matchups. I will also describe trends for each tactic. In section IV we’ll explore matchups and sideboarding, including the basic dynamics of each common matchup, key lines of play, and critical tactics. I will also explain your approach to sideboarding, and provide basic guidelines on how to sideboard. This section will draw lessons from actual game play to illustrate key lines of play to pursue and avoid. Finally, I will part with some closing thoughts on the future of the archetype, advice for tailoring this deck to your own metagame, and preparing for future metagame shifts.